Overheating of Photovoltaic (PV) solar panels is a very common problem faced by many home owners who has invested in a residential solar power system, particularly in hot regions. Every solar panel is designed to work in an optimum range of temperature. During the hottest parts of the day, it may so happen that the temperature exceeds this optimum range. The result is a drop in voltage output in the PV panel. This is a typical phenomenon and gets rectified once the system is cooled down. Normally the panel is designed in such a way, that some drop in the voltage will not affect its efficiency. 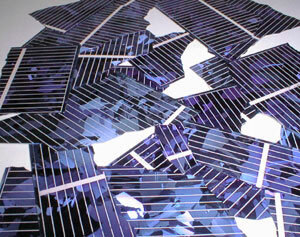 For example an 18V PV cell at 25 degree Celsius will work in the range of 17 – 18V. So even if the atmospheric temperature is high and the efficiency of the cell falls, you may expect to get a voltage of 12 V.
But if the efficiency falls further, be sure that there is no problem with the electrical wiring connections. If your panel does not regain efficiency after cooling, the fall in the voltage of the cells may be caused by corrosion and expansion due to high temperature. Under such circumstances you need to cool down the panel by putting the array under a shade. Cover the panel and pour water on it. These simple measures should be sufficient to cool down the panel and give the right voltage, if there is no other problem with the circuit. But if the voltage output does not improve, there is definitely some fault in the electric circuit and you need to fix it immediately. Use a selective shading test to identify the faulty cell. This will help in identifying the faulty cell or wiring by smaller parts. After you have shaded 3 to 4 cells, the output should be reduced by half. Disconnect the panel and monitor the output of the cell with a multimeter. If you do not have a multimeter, you may use a test load such as a fan to monitor the output. If after shading a part of the panel and the voltage remains unchanged, this is the part which has the problem. Once you have detected the faulty part, check the tabs and the wiring junctions around the affected area. Look for any corrosion that might be the cause of the problem. Increased resistance of faulty solder increases the load and resistance and leads to continuously overheating the cell and consequently the panel will get damaged. You need to rectify this problem immediately. Moisture is a big problem for solar panels. In places close to a sea, salty and moist air corrodes electric connections and aluminum frames very fast. Wood also get distorted and twisted with moist air causing breakage of tab connections. It may also result in the formation of crack in a cell. All the corroded and oxidizes metal parts must be replaced under such circumstances. It is worthwhile to go for aluminum or perspex sealed panel if you want to avoid these problems, though it may involve some extra cost. Another problem, though not very common is the damage of blocking diode. Blocking diodes are used in solar panels to prevent the discharge of the batteries during the night time. Damage of blocking diode will result in no power output. So if you are getting no power from your panel, and you have eliminated all other possibilities, carry out a diode test. If you find the diode to be faulty, replace the diode. If immediate replacement is not possible, take out the diode from the circuit. Make sure to disconnect the panel at night, otherwise the battery bank will get discharged. Some people use a number of smaller diodes that will sum up to the required amperage. This may help in reducing the cost, but invariably is an invitation to e bigger problems. As current flows in the path of lowest resistance, so when a number of smaller diodes are used, it will flow through the smallest diode and will continue to do so, till it fails, then the next higher ones will follow. Thus one by one all the diodes will fail and finally the entire system will blow out with a risk of fire. Remember, if properly maintained, solar panels are very reliable, even in cloudy or snowy weather. Keep your panel sealed to protect it from moisture. If you follow these simple rules, your solar panel will keep working, free of any problem.